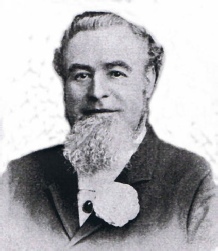 Founder of the firm of Mitchells and Butlers Ltd. He was widely known for his many charitable actions and the great interest he always took in Friendly Societies. The esteem in which he was held was shown by the respect of the crowds of people who lined the whole length of the streets while the cortege passed. 13,000 people visited the cemetery the day after to show their respect, and to view the hundreds of floral tributes. William Butler came from Hinckley in Leicestershire, and when only 16 he walked to Birmingham. He worked in the Crown, Broad Street, and in 1866, took over the license at the London Works Tavern, Smethwick. Ten years later he moved back to the crown but this time as licensee and brewer. He was prospering and continual building and rebuilding work enlarged his brewery and Inn beyond recognition. When more expansion was needed, it was logical that two leading breweries should join forces creating Mitchells and Butlers at the Cape Hill Brewery. The rest, as they say is history.